This year I wanted to showcase artificial flowers on our pastel themed tree. 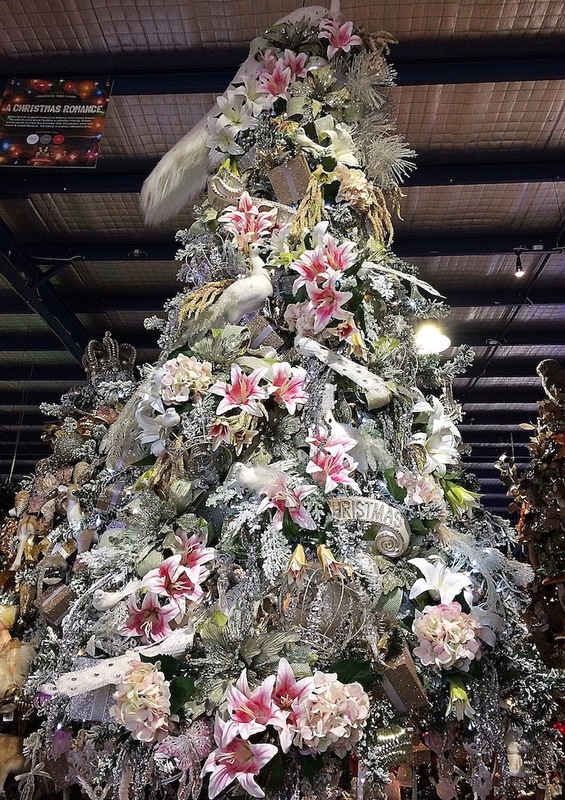 The fashion for faux flowers incorporated with traditional Christmas decorating continues as a major trend at all the international design shows. The mix of faux blooms with conventional Christmas floristry works surprisingly well. An update for 2017 that’s fresh and modern. In the beginning our flocked tree was decorated with 1,200 cool white lights which cast a cold blue hue. I really wanted a warmer colour palette to complement the pastel decorations so I added warm white lights over the top of the existing cool white lights. Don’t worry about mixing your lights, in general the more sparkle the better. The smaller decorations were added first and the floristry, crowns and peacocks came later. It’s normally the other way around but sometimes stock availability dictates the process. We had some amazing statement pieces like the flower doll by Katherine’s Collection and the white peacock by Goodwill ( used as a tree topper) to complete the look.